At the end of August, the government and the QTU officially announced the highly accomplished and lead teacher classifications, the most significant change in the classification and career structure for classroom teachers for more than 25 years. But what does the process involve, and is it worth the trouble? Who better to ask than those teachers who have already been through it? Over the next four pages, QTU members who successfuly applied for and achieved HAT classification during the pilot, and one who trained as an assessor, recount their experiences and share their advice. When the information for the HAT pilot was released, I looked at what was required and realised I was already working at that level and contributing in projects and extra duties throughout the school. I felt the HAT would be a great way to get recognition for the work I was already doing and an opportunity to reflect on my own practice. The main benefit of the HAT/LT process is that it will assist in keeping great teachers within the classroom, rather than losing those teachers to administration roles. By gaining my HAT certification, I can remain in the classroom doing a job that I love. I couldn’t imagine myself not in front of a class, the students are my inspiration for what I do. It is a nationally certified process implemented to reward and recognise those teachers who go above and beyond their normal classroom duties. It is a lot of work and it is hard, but it’s worth it. I have only come across a couple of people who have misunderstood the process and I showed them my portfolio of work I used for the certification. They changed their minds after a brief look and realised that the HAT/LT certified teachers have worked hard for the certification. The HAT/LT certifications are not just handed out, they are earned. These are professional classifications rather than pay levels or promotional positions. Professional classifications are gained through hard work and determination. To gain professional classifications we are also assessed, whereas our pay levels increase automatically each year we complete of teaching. Completing the process for HAT has been the most challenging and rewarding task I have even undertaken. I learned a lot about myself. I already had all the evidence and documentation required for the portfolio, so it was just compiling the portfolio and checking that I had covered all the descriptors completely. I am already encouraging others to apply. The best advice I could give is to start collecting the evidence early, don’t wait until the PDs. Also, volunteer for any projects around the school or initiate new projects. The more evidence teachers have, the easier it is to compile the portfolio. Also, it is important to have a few very supportive friends who won’t let you give up. I nearly gave up once during the process, but my network of friends kept me focused. Organisation is important, folders to separate the evidence sets will help, and enlarge the evidence map to A3 size. If anyone has any questions or needs support, they are welcome to contact me. Good luck to all those who apply! Even though I have been teaching for 14 years, I never realised just how much I truly did in my career, even on a day to day basis, until I participated in the highly accomplished teacher (HAT) trial. I applied for HAT because I wanted to know where I was against the national standards. Teaching is my passion, but any teacher can attest that the time spent on preparation and teaching can come at a personal cost and I felt for one that I wanted to be recognised for my work and the impact that I had made in my profession. My friends and family will know exactly what I mean. HAT not only helps you reflect on your work, but is also a recognition of how your work impacts upon your colleagues and students. That makes teaching very rewarding and gives you focus and direction on how you continue to teach with a focus on collaboration, supporting other teachers. The process of the HAT was one of the most rewarding professional development activities I have ever done. It is ‘personally reflective’. I work with passionate teachers who are experts in their field and it is amazing how when working collaboratively as a team, from planning units, preparation of resources, execution of unit of work, enhancing assessment and using structured collaboration and reflection, great work comes not only from individuals but from teams. I had already been working with teachers across different areas for some time, and so being part of the pilot, I only had 13 weeks to put the application together instead of the longer time frame. Because you may use evidence from the past 18 months, it is enlightening to suddenly reflect on what you have done. It shouldn’t be about suddenly changing your behaviours to tick boxes for an application. HAT is about what you are already doing. One of my personal bugbears is the fallacy that "you need to be in leadership" to contribute. A good leader will not only listen to their staff’s input but provide leadership opportunities to all of their staff to lead work in their faculty. Everybody has knowledge, application, and technical capability to share in collaboration with others. At Atherton State High school, we have had a push for a long time on the importance of collaboration. HAT allows me to stay in the classroom, contribute in leadership roles, impact and be impacted upon by fellow colleagues. The benefit of this route is not just to the individual. It is the behaviour that teachers and schools will go through, becoming more collegial and impacting each other’s work, that has the capacity to truly transform teachers into better teachers. I work with people, and that is what HAT is about. I did not do HAT to be promoted. In my case, when we applied for the trial, I used evidence from the past 18 months. Normally you get a lot more time to put together an application for HAT but we only had 13 weeks. So for the most part I had to use evidence of what I had already been doing. This was good for me because it made the reflection all the more personal because it was a confirmation of my work. The 13 weeks was used to fill in the gaps and weaker areas of my application that I had identified. I believe these are professional qualifications and not promotional positions. An example of this was the fact that I was Acting HOD of Junior Science for 1 year, and it had counted little in my application. I felt my assessors were more interested about how I impacted upon others as a teacher rather than anything I had accomplished as a HOD. Applying to be a HAT is a voluntary process and it gave me the opportunity to operate at a higher level. It was my choice to pursue the challenge to develop my capability to this level and I found the process to be highly rewarding. My classes also now benefit on my renewed focus on implementing nationally recognised teaching practices. Relative to the standards, I know that my practice in my rural school matches those of teachers in other locations. My colleagues and students and my community are very proud of the fact that highly accomplished teachers are part of our school and have an impact and they know their community are receiving high quality education. I’ve heard teachers talk about the process when they observed teachers prepare for their HAT. And I honestly feel until you have written a full application yourself, you will not fully appreciate the honest reflective process that you will go through. There is something unique about writing the application process that I had never experienced on that scale before that places value on you and what you do. I have the honour of working with fantastic teachers that I look up to, and if you kept a diary of what you on a daily basis, especially in relation to the standards, you would be very surprised of just how much we do. In my school at least, the community acknowledges the skills that HAT offers. Great teachers exist everywhere, HAT gives them the opportunity to celebrate their professional skills rather than focus on a pay point that may or may not guarantee good teaching practice. It should be seen as another positive recognition of excellence in teaching practice. Yes you should apply but you need to be prepared to go through an ‘honest’ reflection process first. A lot of teachers, in their head, say “Yes I do that, and that” etc. Prove it! With physical evidence. Try doing the questionnaire again, this time finding the physical evidence that you have done it. Emails, newsletter articles, annotated unit plans etc. Every day we do all sorts of activities that would tick boxes at the highly accomplished level. You must find the physical evidence of what you have done, but more importantly the evidence of the impact that it has on your colleagues or their students. An example would be helping a colleague struggling with a poorly behaved class. Can you show data from their class that less students have been to a behaviour room as a result of your working on strategies with that teacher? Do you have an email from your colleague thanking you or speaking of the impact this had in their classroom? This is the type of evidence you need, and at least two separate examples across 37 criteria. How do you engage others, how do you help other teachers? For example, guidance for troubled students, do you organise Indigenous elders to come and give a presentation to help embed Indigenous perspectives? Student support, special education units, teacher-aides, faculty members and community representatives etc. How is the impact of how you work collegially felt by others? If you suddenly need to change your behaviours because you want to tick boxes for HAT, perhaps it is not for you yet. The HAT recognises behaviours that impact on colleagues and students, with evidence. If you have engineered an application to tick boxes but really are not working with your colleagues, then it will come out. Become involved with your colleagues, team teach together. Reflect together. This, if done honestly, can change teaching, it can change working lives, it can draw teachers closer together into successful working teams, it can lessen workloads as others share of themselves. The HAT process can help focus teams of teachers and bring people forward together. It can nurture less experienced teachers and give renewed focus to more experienced teachers. Who wouldn’t want to work in that school? Just like a leadership role, you cannot put together an application in five minutes. You must gather your evidence over time. Only teachers who have finally put together an application realise the size and scope of it. When you apply for the HAT, you should have most of the evidence already. Later in the HAT application, you must become very selective and even throw out some evidence for better examples. You are only allowed so many artefacts (and each artefact can hit multiple criteria). But if you miss even one of the 37 by accident, you will not make it to phase 2. This is really important. Create a project that is linked to the school’s improvement agenda and research methods. An example could be a team teaching episode over a term or two with a team of teachers. This allows for a full process of collegial engagement that can help enhance and model how effective collegial engagement can be as a powerful tool. There are 37 criteria that you need to account for, so plan your projects well. This will help you write artefacts that can address multiple criteria. Thank your colleagues. We don’t thank our colleagues enough and explain how their work has impacted upon our work and teaching students. Some people think this is fabricated, but if you thank colleagues, they will do it to you. Be accepting if a colleague asks you to comment or reflect on something you may have done with them. With the new standards, it is no longer about HAT. There is graduate, proficient, highly accomplished and lead and a lot more teachers will be gathering evidence into the future for portfolios at all levels. The HAT is not unachievable. But you do need to prepare for it. Just like a leadership application cannot be written in 5 minutes, nor can the HAT. You will use evidence from all parts of the school. From community education councillors, guidance councillors, faculty members, HODS, admin, P&C, student teachers, special education units, community and more. I don’t see how someone can put together an application and not work with a variety of people that can confirm the impact of your work. This is not a simple tick and flick. This is a far wider process. But you will find you are most likely already doing all of these things to a degree and will find the process rewarding once you have completed it. I would ask, how are you making a record of what you have accomplished? In closing, it is the most rewarding Professional Development that I have done. It has been more than just a recognition, it is a process that has focused my work in a direction that has given value to my teaching, to my work with colleagues and students that is my passion and my career. I applied for HAT because I thought that it would be interesting to be part of the trial. It would give me an opportunity to provide feedback on the process and also I took it as a challenge to see if I would meet the standard. The HAT process turned out to be rigorous and challenging, time consuming and reflective, but the benefits made it worthwhile. The HAT and LT positions enable a teacher to remain in the classroom and have a goal to attain. This step gives teachers an ability to earn a higher rate and not have to leave the classroom. It assesses how I contribute to the college, both in and out of the classroom. Whether I attain the classification or not is dependent on what I do and the impact this has, not on any other outside influence. The application process has a cost attached and is hard, and the process itself is difficult, so no one can fake their way through to gain accreditation. This is a national classification aligned to the Australian Professional Standards for Teachers, it is not just a step that every teacher will be able to achieve simply through teaching for long enough. The independent process makes this a truly professional classification. I would encourage teachers to apply, but only when prepared. I would suggest working through the standards, identifying areas that are already met and ones which may need some work, and collecting evidence before starting the application process. As a quality learning coach at my college and a beginning teacher mentor, I thought applying for HAT would be an opportunity to reflect on my own teaching practices. It was also a tool I used to cement my own understanding of the standards and what these standards can look like in different contexts. I believed this would be something I could use in my mentoring/coaching role quite effectively. This process also rewards those teachers who want to make teaching their career path, not administration. My passion is the classroom - unfortunately the traditional school career progression could only see me being rewarded financially by going along the administration route. This is something I did not want to do. The process was quite challenging, time consuming, frustrating, but enlightening. It supported my view that this process had enough depth that only teachers who truly had the warranted skills and abilities made it through. If you’re not prepared to put in the hard work, then this role/process is not for you. Some teachers have just said the process is “too hard” and have not gone any further. But it’s a process that is rigorous for a reason – it is not an achievement that is obtained just because you’ve been teaching for 10 years. You have to substantiate, reflect on and provide authentic evidence that you have the attributes of a highly accomplished teacher. It requires you to reflect on your practice and how you deliver quality teaching in the classroom and how you mentor colleagues to do the same; how you involve the community in the educational process; what you do that makes you an effective and engaging teacher; what it is that drives you to ensure your students are being the best they can be; how you can do this better. It is these skills and attributes that the process is reflective of, not your ability to write a good resume and interview well. This is why I see the process as a way to acknowledge professional knowledge and skills, rather than just a move through the pay levels or promotional positions because of length of service. I’ve only been teaching for nine years. I chose to go back to university to become a teacher when I was 40 because I wanted to make a difference in a student’s life, not because I was looking for financial rewards. If you are interested in applying, my advice would be to spend at least 12 months gathering evidence to support your teaching practice; reflect on your teaching practice; look for ways to improve your contribution/involvement in the school you’re at, build relationships in the community; cement your understanding of the teaching standards and what this looks like in your classroom and how you interact with colleagues and the wider teaching/learning community. Be confident that you are a HAT and then prove it! From 2019, classroom teachers have a wonderful opportunity to have their personal professional accomplishments recognised and their drive for improvement in their classrooms and schools rewarded. After a lot of hard work and campaigning by the QTU, the Queensland Government has formally announced the establishment of the highly accomplished and lead teacher career structures. Many teachers and administrators have reflected that they would have stayed in the classroom if this had been around 10 years ago. I applied to be an assessor when the pilot was first announced, prompted by a background in collegial coaching and a belief that our teachers are doing wonderful work. I applied via an EOI. A panel with representatives from the department, the QCT and the QTU selected the assessors. The first round of training was online and was quite stressful at times, given the new language, time taken to complete and seriousness of being a part of something new. There were two face-to-face rounds where the 20 assessors met from around the state and competed the formalised part of the training. There were online modules, many videos of the national certification process; illustrations of practice videos; assessments and the face-to-face training. 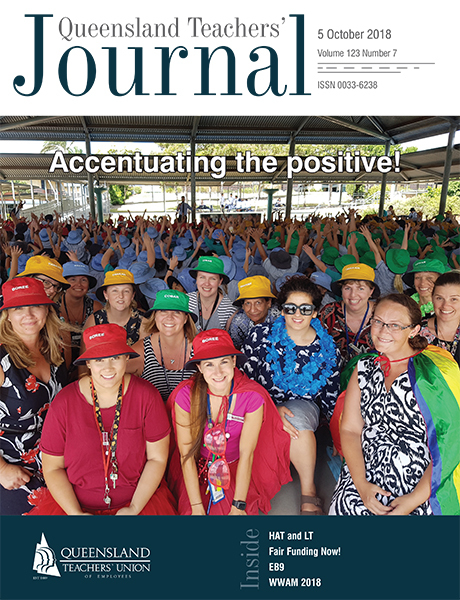 The recent announcement created some concern among members and given that it is one of the biggest things to happen to teacher staffing in Queensland in a generation, I would suggest this is absolutely understandable. At first, I was worried about the fee attached to applying for HAT or LT classification. As my experience has increased though, I recognise that the fee being split across stage 1 and 2 of the process is beneficial, and it only represents a proportion of the actual cost of certification. Getting a day of relief to prepare a folio at this point is also a win for our teachers. For an experienced senior teacher, a HAT certification is a pay rise close to $10,000 per year. For a teacher Band 3 Step 1, the pay increase would be in the realm of $25,000. This does not take into account the benefit to superannuation either. Yes, it requires a fee, but to have professionalism recognised is a big way forward. Ultimately, If the process is not right for you, don’t apply for it. There are many other options available: flow through on the incremental scale to EST; take the promotional path of HOC, HOD; DP and principal. The wonderful thing about our system is that is does provide many options and pathways. HAT and LT certification is just one more. In both the HAT and the LT certification, there are 37 descriptors across three domains to be assessed against. I would encourage prospective applicants to “play the long game”. Evidence is valid for up to five years. If this is something you would like to do, complete the self-assessment tool – honestly. Every word is important. Identify your strengths – areas in which you are already operating at a HAT or LT level. Start a mind map of a story – supported by evidence. What evidence do you have? What is the story? How many descriptors can this support? Then, think ahead and map out over the next two years what evidence you may need and how you might get it. Talk with your school admin team. Complete your Annual Performance Review using the Australian Professional Standards for Teachers. You may be lucky enough to have a lot of evidence, and this will then shorten your timeframe of applying. Within the pilot, applicants have prepared folios within 13 weeks. Many were successful, others were not, but all are to be commended on getting their information together in that time. If you are an aspirant, what have you got to lose? Start the process. Think like an applicant in all you do. Think of how things can be evidence as you go along. If you are not an aspirant, give it a miss. There are many other options in our system that reward the great things you do every day.